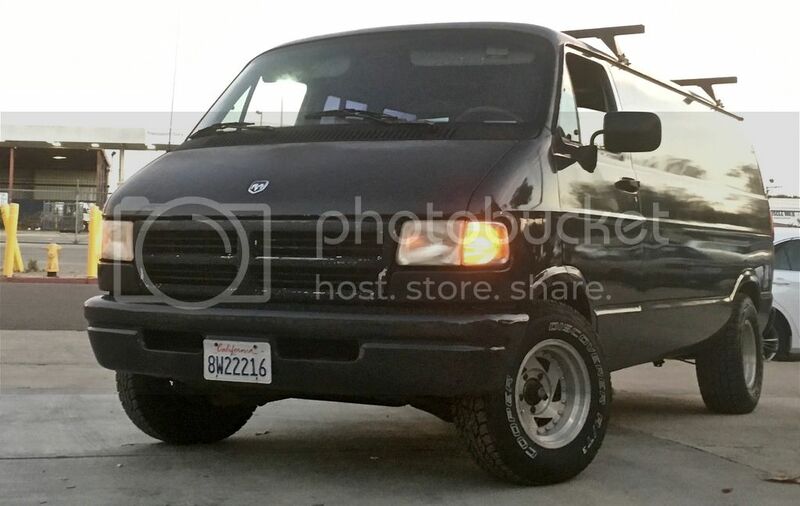 Okay, first to remind everybody, I have a 1994 Dodge B-250 5 lug van with 30x9.50x15 tires on it, and they look stock. . . I want to go wider, keep a AT tread, and not rub in turns or dips. So, my question is, does any one know, if I went with the coil springs from a 8 lug van, could I fit 31x10.50x15 tires on it then ? I know the factory tire on a B-350 is a 245/75/16 (30.5” tire) and my factory size tire is a 235/75/15 (28.9” tire), so I think it would work, but I am not sure. Also, what other parts might need to be changed to swap in the larger (?) Springs ? check out the cooper discoverer at3 and general grabber. they make some weird 15'' sizes.. check out www.tiresize.com . you cant buy from their site, but they have every tire in every size made by man on there, and the specs to go with em. the reason i didnt go with an all terrain t/a is because of the width. they only look good on shorty's. coopers again. second set. the last ones were 3 years old and tons of tread left. good tires and you get a white letter, and i gotta have that! i put a combo on my van with no mods at all and OLD shocks! no rubs.